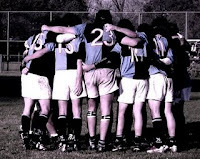 TOTAL FLANKER...a rugby blog: Juan Cruz Migliore R.I.P. On Friday I posted a lighthearted look at the ELVs and in particular the proposed new law which allows the collapsing of mauls. All such frivolity flew right out of the window this morning, however, when I received an email from Nursedude drawing my attention to the tragic death of 20 year old Argentinian rugby player Juan Cruz Migliore who died in a Buenos Aires Rugby Union Premier Division game on Saturday after having suffered a broken neck when a maul collapsed on him. Ever since the law allowing mauls to be collapsed was first proposed I have had huge concerns as to player safety, convinced that an increase in injuries would be the inevitable consequence. I must admit, however, that I did not for one minute envisage that a player might die from such injuries. The IRB might argue that, technically, the death of Juan Cruz Migliore was not the fault of this particular ELV as it is not due to come into force until 1st August. To do so, however, would be to stick its head in the sand once too often. This tragedy sends out a clear warning signal as to what might happen when the collapsing of mauls is legalised. It's time for the IRB to show a bit of backbone and repeal this law now. turns out I just posted much the same thing. A sad loss. The IRB needs to look at themselves long and hard. Is chasing the extra couple of southern hemisphere fans worth endangering its players lives? This is the 2nd death from neck injuries in rugby in a couple of weeks and this is before the ELV's are even in place. Rugby league is looking more and more appealing. Hi TF, thanks for posting this. At my work, I can no longer access blogs, so I have to do my blog writing between other household tasks, walking the bulldog, holding onto baby Duncan to spell his mother. The article that I found in Planetrugby.com chilled my chunky prop flesh to the bone. I felt that there would be injuries from collapsing mauls, like blown out knees and torqued backs, but I did not imagine somebody actually getting killed. All of us who play the game know there are risks, but in a tough, physical game, why would the IRB give the green light to a law that can endanger more players. I'm an argentinean rugby journalist -former player also- and i'd like to post a comment about juan cruz's death. first of all, i was watching the match between cuba and san fernando where migliore died. it is a terrible loss because he was such a great kid and had a love for the game far greater than a lot of players. the day started great for him, because he scored the first try of the match just a few seconds after the start. still, i have to say that he died in a ruck, not a maul. he was cought under five players afer a ruck collapsed on him, but not under a maul. i'm not deffending the elv's, i just want to set the record streight about juan cruz. Thanks for the clarification - sorry, perhaps I jumped the gun a little here. Although I am convinced that the legalised collapsing of mauls will lead to increased levels of serious injury on the rugby pitch, I wouldn't want to misrepesent Juan's tragic death. I guess we must acknowledge that it can be a dangerous game we all play and that sadly tragic accidents do occur, although thankfully very rarely. I do hope though that the IRB can think again about bringing in a law that will increase the risk of injury to players. Juan Cruz, I miss you! He was my buddy from School, I played in Hindu, CUBAs rivals. This is by far the saddest loss in my life, tops my aunt and grandpa, I loved this guy to death. Hi Benjamin - thanks for posting. I'm sure the entire rugby blogosphere and indeed the entire rugby world were shocked and saddened by Juan's death. We also shouldn't forget Neath scrum-half Gareth Jones who died in hospital last week following a neck injury playing against Cardiff on 20th April. Hi Flanker, in the end, even with the clarification from our friend from the Pampas, I still think the rule allowing collapsing of mauls is the most potentially dangerous ruling the IRB has come up with. Hello, i posted in italian why i'm against the law that allow collpasing a maul. Even if Juan died in a ruck, every potential dangerous situation should be avoided. They introduced the 4 step scrum, and now they are allowing to pull down a maul.